Here’s another post from my anonymous friend…enjoy! The word phosphate has a number of different meanings. It can refer to a salt or an ester of phosphoric acid in the study of chemistry. But for my purposes, it is a soda fountain treat made from a flavored syrup, seltzer water, and a little citric acid. The phrase “soda fountain” may be quite foreign to many, especially younger, readers. There are a lot of restaurants that purport to serve various ice cream concoctions including sundaes, shakes and cones. But if you like ice cream, there is nothing to compare to the soda fountain. Decades ago, many pharmacies contained these fountains. They had available ice cream, syrups and toppings, whipped cream, cherries, and spigots with seltzer, Coke, and other drinks. Either the pharmacists themselves or a soda jerk (no, it is not a derogatory term—look it up) would masterfully prepare various combinations of the ingredients to the great pleasure of the customer. One of my favorite and most special memories is that of a Rexall pharmacy with a soda fountain. My Dad had an office in a small town in southern Illinois many years ago. Mr. Karber owned the pharmacy, which was across the street from my Dad’s office. Sometimes, on Saturdays, my Dad would bring me or my sister along for the day, and we could enjoy the treats the town had to offer. There was still a wooden sidewalk along part of the main drag, at the end of which was an honest-to-God penny candy store. In the other direction was a little cafe with great burgers and fries. But the main attraction was Karber’s. Malts, shakes, sodas, floats, phosphates, banana splits, sundaes…there was a regular soda fountain menu, but they would make pretty much anything you wanted within reason. Malts were handmade in a large metal cup on a real malt machine. You could request the addition of a raw egg to make it richer (imagine trying to ask for that now), and there would always be an extra portion in the metal cup that you could pour for yourself after drinking a bit of the malt. Phosphates were cold and refreshing; sundaes and splits were large and elaborate. And all items were prepared with pride and care; service was always with a sincere smile. Nowadays, very few places have the charm and character that was so obvious at Karber’s. Quality has diminished also, in my opinion. But I recently had occasion to step back in time and enjoy the soda fountain experience once again. I just returned from a visit with my sister—she lives in a fairly small town, and near her house is a former drugstore. I believe that there is a bar and restaurant in the back portion of the building. But the front is a very authentic soda fountain. On my first visit (I went three times over the weekend), I asked for a chocolate phosphate. Even though the menu only had citrus flavors listed, one of the owners made it up for me. And smiled. For just a moment, I was 8 years old and back at Karber’s. They say you can’t go home again. But sometimes you can see it in the rear view mirror. 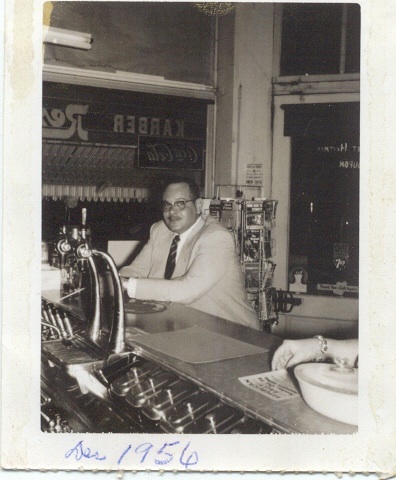 Dad at the real Karber’s in 1956. I have come to realize that I am intolerant of those who are intolerant. Ironic, isn’t it? Does that make me one of the people that I cannot tolerate? And is that a bad thing, or a good thing? After having to spend time around several people who have come and gone in my life who are the intolerant type, I’ve come to the conclusion that those who are intolerant are also usually not going to really listen when you object to their intolerances. I guess they also don’t tolerate debate, when it comes to their opinions. When I say these people are intolerant, it might mean many things…impatient, unaccepting, closed-minded, prejudiced, biased, racist, egotistical, narcissistic…the list goes on and on. And when I say I am intolerant of them, it means I cannot abide by their attitudes, beliefs and behaviors. Some of these intolerant types seem like pretty nice folks on the surface, but are sitting on some very strong stereotypes. It’s like a time bomb or a tripwire. Just walking along, having a nice time, and then, BAM! Now don’t get me wrong…it’s perfectly fine by me if you want to be any of the things on that list…everyone is entitled to their beliefs. But once you start spouting off about it, or trying to get others to believe what you believe, or start to exhibit abusive behavior towards others, then you’d better check yourself. At least if you’re around me. Gosh, that sounds threatening, like I’m some tough guy who will set you straight. And there’s part of my problem with this…I’m a wimp. Or maybe, better put, I’m non-confrontational. I’ll do just about anything to avoid a conflict or confrontation. So when I am in the company of one of these intolerant people who starts voicing his or her opinions, or treating someone in an unacceptable manner, I tend to cringe inwardly, and shift my eyes. Maybe develop a nervous tic, or even leave the scene. I tend to retreat for a couple of reasons. One is I don’t want to engage in this conflict. I’ve learned it doesn’t do any good, and likely would just get the person more fired up. The other reason is that I get so angry and frustrated upon hearing the intolerant rant that I’m afraid I’m going to start in on that pointless rebuttal in a not-so-nice way, and then become known as one of those intolerant types. I’m sure there will even be those that are intolerant of this piece, and that’s ok. Just don’t tell me, ok? When I was in high school, I had relentlessly begged for a puppy. Finally, my dad caved in, but not without a firm list of parameters. I would have to take care of the puppy…feeding, fresh water, walks, cleaning up messes…it was a lot of responsibility. Of course, I promised I would be responsible…just, PLEASE, let me get that puppy! There was a bit of debate over what type of dog to get. I wanted a beagle, which I would name Bagel, just like Barry Manilow had. But my dad and brother were leaning towards a cocker spaniel, because Dad had had a cocker spaniel named Fella, which was, by all accounts, a wonderful pup. In the end, the cocker spaniel was the winner, and we decided to name him Flaps, because of the floppy ears. In preparation for Flaps coming home with us, we got a collar, a leash, bowls, food, and piddle pads. We also got a big piece of fiber board to block off the kitchen for potty training nights, and painted his name on it in large, yellow letters, letting him know this was HIS own special door. Of course he would want to spend his nights behind HIS door, right? Along with all of the responsibilities Dad had imposed, he also talked with us about training the pup. We would have to take him outside for frequent potty breaks, but through the night, he would stay in the kitchen, which didn’t have carpeting, and would be easier to clean up. He explained to us that a puppy would likely cry and whine when left alone in the kitchen all night, missing its mother, no doubt. He cautioned us NOT to go into the kitchen if we heard him crying or barking or whining during the night. We HAD to be strong, and let the puppy learn to be alone. It was very important, Dad went on telling us, NOT to teach the puppy that if he made enough noise, we would come to his rescue. When we brought little Flapsy home, we were SO in love with him…cuddling all the time, barely leaving him alone to eat, pee or poop. But eventually, night began to fall. So, we got the piddle pads on the floor, put up the board with his name on it, and said our good nights. Dad gave the stern reminder NOT to go to the dog if we heard him during the night, no matter what. It was a rough night for all of us, Flaps included. He did NOT feel special for having his own, personalized door, keeping him neatly tucked in the kitchen for the night. He wanted to find his new humans, and cuddle up with them. He cried, he whined, he barked that little, high-pitched, yappy bark that pups have. He howled. He scratched at the door we’d so carefully crafted for him. He was NOT a happy camper. In our rooms, my brother and I tried to be strong…tried to ignore the anguished cries that went on and on. From the sound of the scratching, surely he had tunneled out to China by now. Then, as loud as it had been, it was suddenly quiet in the kitchen. No barking, no crying or whining, no howling, and no scratching to escape. My brother and I both eventually got up to go see how the puppy was doing, since it seemed he’d suddenly gotten over his angst at being left alone. The vision we were met with was indeed comical. Flaps had not gotten used to his nightly digs. No…my dad was sitting at the kitchen table in his underwear, cradling the wee pup in his arms, talking in sweet baby dog talk to little Flaps, assuring him it was all right. The firm words from Dad were apparently only for my brother and I…Dad was operating under his own set of rules. Neither my brother nor I will ever forget that scene. 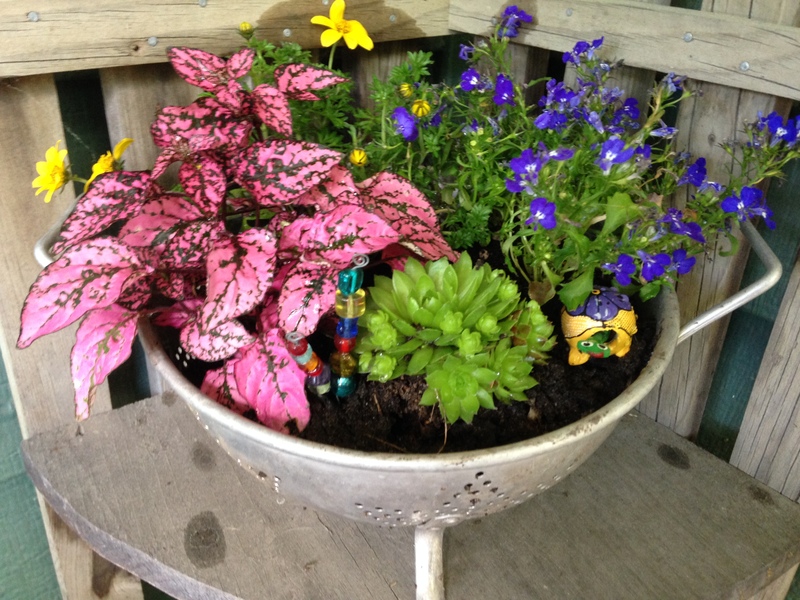 You may recall a post I did a long while back about my new-found hobby…making fairy gardens. I started out making three of them, which are on my porch and in my yard. I love them! As I mentioned in that post, they combine three of my favorite things…miniatures, gardening, and themes. 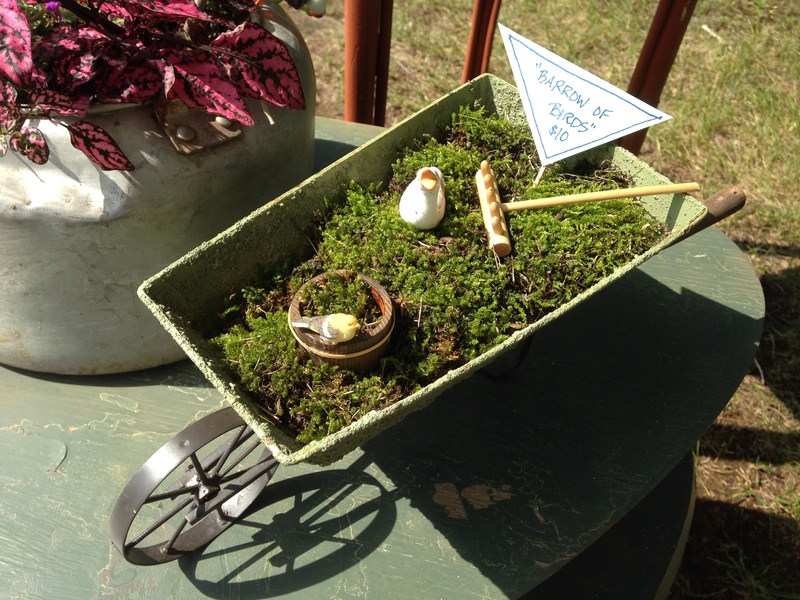 Well, I’ve recently realized a 4th favorite thing of mine that fairy gardens include…garage sales! My garaging has taken on a whole new focus…miniatures, containers, accessories…just about anything that might work in a fairy garden. And now, I am addicted. I ended up making three more fairy gardens shortly after my first three. I had accumulated some items found at garage sales, and still had a small pile of things I’d gathered from around the house. I said to myself, “OK, that was fun. Now I can be done.” What was I going to do with these extra fairy gardens, anyway? It turns out that was just the beginning. My garaging led me to more and more fairy garden items, and ideas for new themes, containers, etc. I even went on a fairy garden expedition with my friend, who took me to a special nursery about an hour away that sold fairy garden plants. I was delighted to find that there are miniature ferns, in more than one variety! And so many succulents! 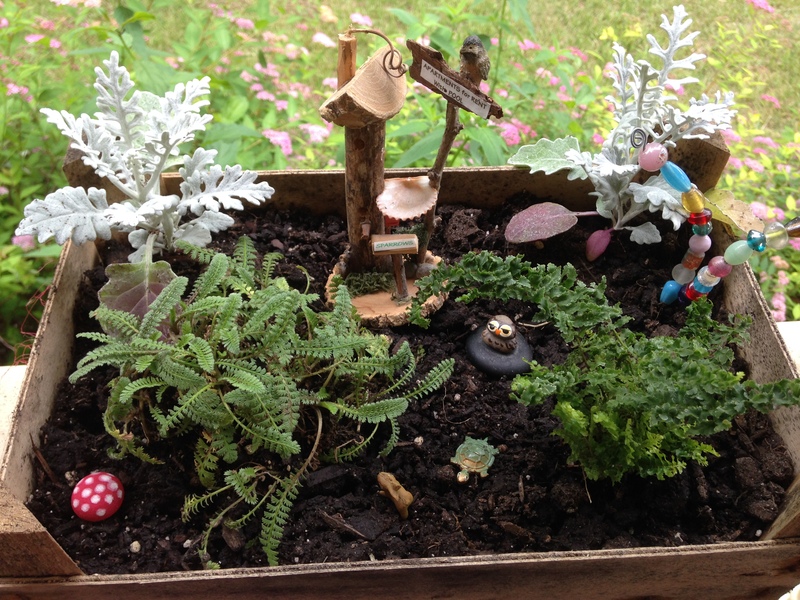 So, I did what anyone with a pile of tiny plants and tiny items might do…I made six more fairy gardens. At this point, I was up to nine. I decided to take them to our local farmers’ market, and try to sell some of them. It wasn’t a big deal to me to make money from this hobby, but it made sense. If I liked them, maybe others would like them, too. I’ve only sold 4 of them so far, but I’m tickled that anyone wanted to buy one. The best part is that lots of people ooh and ah over them. Of course, this is not over. It’s not enough that I made some for myself, made some to share and sell, and found that people like them. Nope. 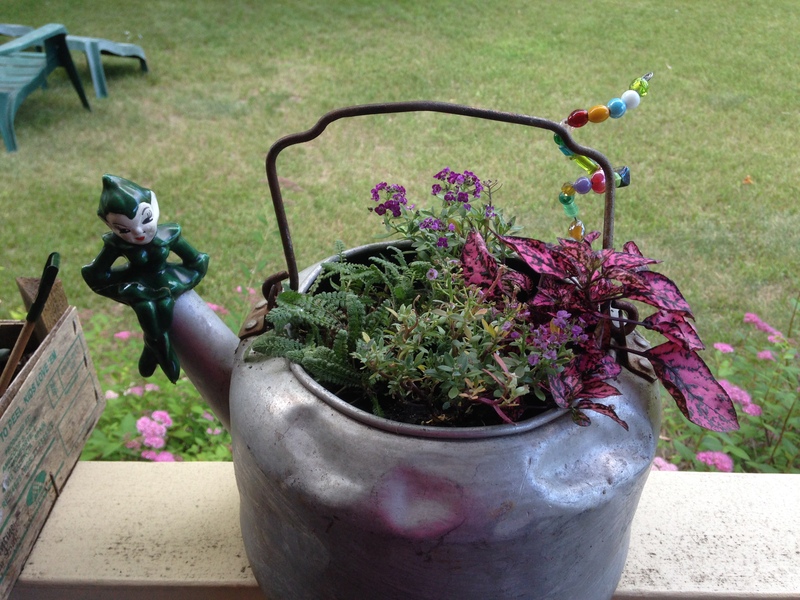 I still keep finding things at garage sales for future fairy gardens. I’ve always thought it amazing that if you are looking for something specific, you will start finding just that at the sales you go to. One summer I found 14 different martini glasses at several different sales for an upcoming martini party I was having…just like they were put there for me, over and over again! But I digress…this is about the fairies. 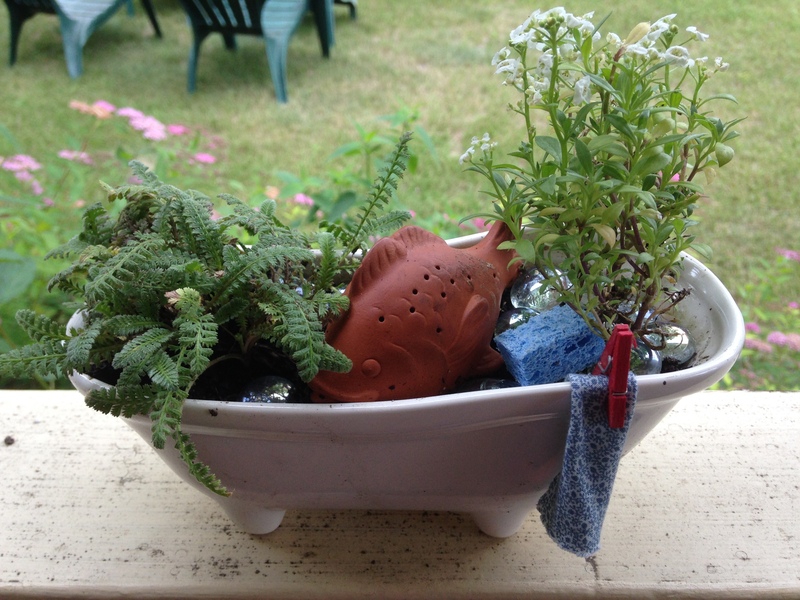 My friends have started bringing me containers and miniature items to use in my gardens. Some of them are going through their own homes, grabbing objects to bring me. Others are watching for things at garage sales, and snagging the perfect little items. It’s somehow ok that they are feeding this addiction of mine. Far better a friend should bring you a tiny wheelbarrow than a stash of prescription drugs. Today I was in a situation where there was an informal gathering of around 15 people. In that small group, just about every type of person was represented. Some I knew well, some just peripherally, and some not at all. I didn’t select the members of the group…I was just one of them. The thing that tied us all together was music. Each person’s musical tastes were different from the next. There were very young people there, and fairly old. Some sang and played while others just listened. Each person who sang or played had a style all their own. If any of us were forming a band, we likely would not have chosen any or all of the members of this group to be in it. We were thrown together by chance. The thing that tied us all together was music. As I looked around at this patched together gang of songsters, I marveled at the way everyone sort of bonded in our short time together. We laughed when we didn’t know the words and were faking our way through a song. We cheered on those who bravely sang alone, when none of the rest of us knew the words. We shared our favorite tunes with total strangers. The thing that tied us all together was music. The most amazing part of the whole night was that every person was having the best time! No matter if we forgot some lyrics, or sang off key, or wouldn’t have asked for a particular song that was played, we all had fun. The thing that tied us all together was music. There’s a lot of unhappiness in the world. Bad things happen. Every day, we can choose to focus on the sadness, the hurt, the fear, the anger, or the frustrations we face in our lives. Sometimes it overcomes us, and sometimes we isolate ourselves in our negativity. But tonight, for a couple of hours, these people who happened to end up together were focusing on the good stuff. Together. The thing that tied us all together was music. Wouldn’t it be grand if we all took time more often to sing?